Riding in a shopping cart may be the ultimate childhood experience. You are forced to accompany your parents on the most mundane adult mission - getting provisions for the family. Confined to a small cage, you must rely on your childhood powers - your imagination - to break free. Having grown up and pushed that cart many times now, I can say that the parent is not usually excited by this trip either. But as a child, you can find a way out. You can climb up into this cagey metal chariot and a chore becomes a rise. The dreadful, boring excursion becomes something to look forward to. A simple shopping cart can be transformed. 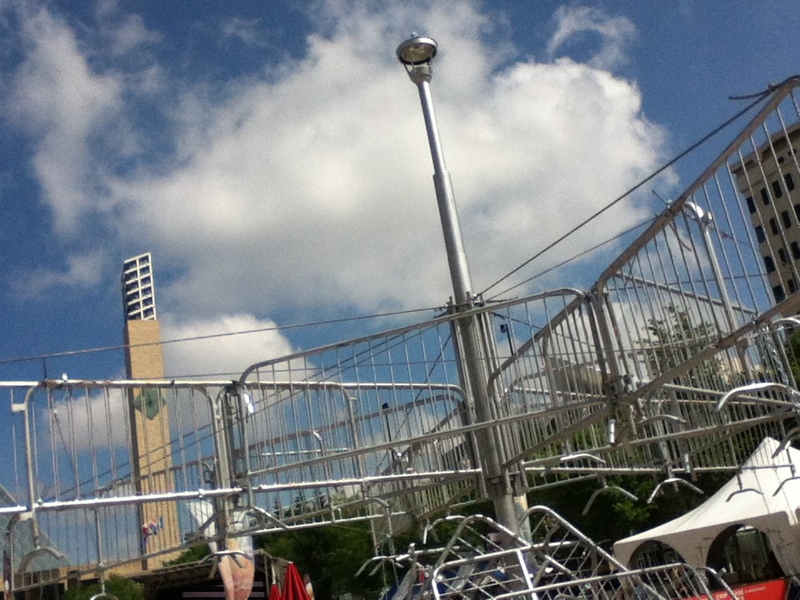 At The Works Art and Design Festival this week, I discovered that a shopping cart can still provide adventure. A group of artists from Quebec called BGL have built a massive installation in Churchill Square called The Carousel. It transforms objects of drudgery and crowd control into a work of whimsical beauty. You first see The Carousel and wonder what it is. It can look like a pile of scrap metal at first. Then you notice the arrangement of things, organized around a central pole, and then you see the flying shopping carts, suspended on chains like the old Swing of The Century at West Edmonton Mall. Then you see it moving, see a smile on a kid's face and realize that this doesn't just look like a ride. This IS a ride. I'm not sure I'd have the courage to hop aboard if I didn't have kids with me, but I did, so I rode The Carousel. There is no motor. The Works volunteers actually grab the handle of a cart and run circles until us riders lift off. Then they do that again. And again. To see my city this way, dizzying past from the inside of a soaring shopping cart, is a gift. I love this piece. I walk by it every time I am in the square. I love it because it is fun. It is silly. It is not pretentious. I love it because of the statements it is making about crowd control and play and subversive childlike joy. We can transform the ugly, oppressive pieces of life through a hopeful, playful perspective. A good sense of humor goes a long way. Perhaps I love this piece most because it communicates all of this and more very clearly, without saying a word, in a public space, to regular people. This piece works outside of a gallery, and it works for people not well versed in the vocabularies of high art. At the end of the day, if you don't 'get it', you likely still have a smile on your face. So you do get it. The Carousel will be in Churchill Square until July 2, just begging you to take a ride.